John Harding Hovious Son of William HOVIOUS and Sarah HARDING. Born in Green County, KY on 7 May 1798. John married his first wife, Elinor STEEL, in Green Co., KY on 29 October 1818 (Elinor was born in Kentucky in 1799, a daughter of William Steel). They moved to Indiana together in late 1821 or early 1822, along with John's younger brother Stephen Hovious. Elinor died about 1823. John later married on 8 September 1824, at Bedford, Lawrence Co., IN, Eliza Emiline LITTEN. Eliza was born 24 Jul 1808, Morgantown, North Carolina, and died 30 Mar 1883, Monroe Co., IN. John H. Hovious established a successful Hattery in Lawrence County. A history of the area says that "[An] early industry was the manufacture of hats....John Hovious owned [a hattery] giving employment to to two or three workmen. Hovious began in 1829 and continued until 1836. Hats sold for from 50 cents to $6.00." The family later lived in Monroe County, where rather than continue as a hatter, John took up farming. John Harding Hovious died on 28 September 1865 in Monroe Co., IN. He is buried in the Hovious Cemetery at the State Park in Washington Township, near his wife Eliza and son Robert. 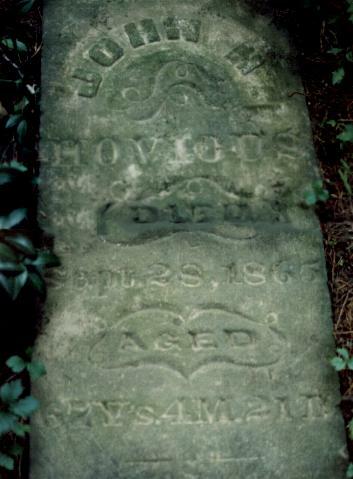 Nancy Jane Hovious, b. abt Sep 1826. Silas Burke Hovious, b. 9 Apr 1828. Sarah Ann Hovious b. 1830, Monroe Co.,IN. Married William DOWNING on 1 Jan 1852, in Monroe Co.
Robert M. Hovious b. 20 May 1831, Monroe Co., IN. Amanda Hovious, b. 1833, married James A. MEDIARIS on 28 Dec 1852, in Monroe Co, Indiana. Thanks to Betty Hovious Hollowell and Steve Hovious for information about John H. Hovious, including the photographs of his grave.